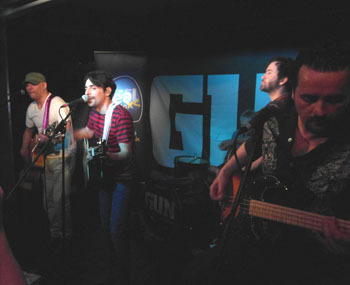 Gun are a band that have been through the highs and lows of the industry over the years. Members have come and gone and the band have been on a hiatus on a few occasions, but their musical legacy has always stood the test of time and whenever they re-emerge you can be assured that whatever they turn their collective hands to will be of the highest quality. 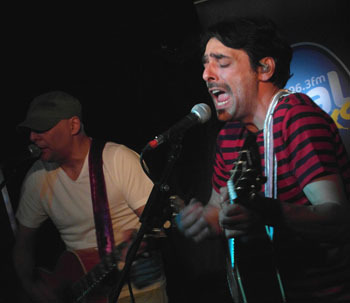 Tonight's show was less of a gig and more of a showcase session organised by Real XS to herald the band's latest return and to give a few selected punters a taste of the band's forthcoming album aptly titled 'Break The Silence'. Compere for the night was long time Gun supporter, Tom Russell, who has championed the band from their very early years, so after a quick intro the guys took to the stage for a semi acoustic set which proved to be a cracker. Being a showcase for the new album, unsurprisingly, that is where most of the set was culled from, opening with 'Lost & Found' the band were in good form. 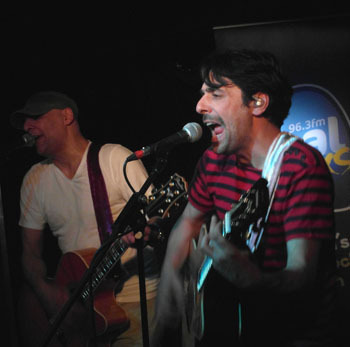 The hub of the band are, as always, the brothers Jools and Dante Gizzi, who have been the heart and soul of Gun for many years. 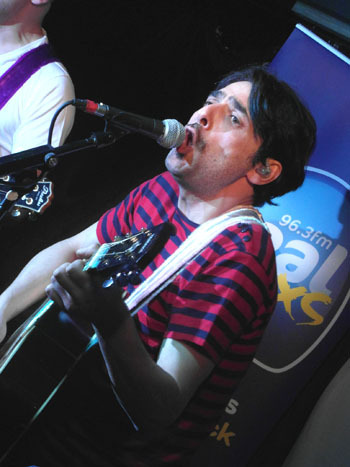 In this current line up Dante has emerged from behind his bass guitar to take up the frontman role after Gun parted company with the last incumbent, Toby Jepson, who left to pursue other projects, a wound that appears to be a bit raw judging by some of the comments made later during a question and answer session. Three other new tracks followed, namely 'Running Out Of Time', 'How Many Roads' which was introduced as the only ballad on the album and 'Last Train From Central' which is the first track to officially surface from the album. Rounding off the short but sweet set the band delved back into the depths to play one of their earliest hits 'Better Days' which went down a storm with the assembled throng. The guys looked genuinely amazed at the crowd reaction and were encouraged back for another unplanned encore in the shape of 'Steal Your Fire' which worked really well given the acoustic treatment and the addition of 150 people on backing vocals. 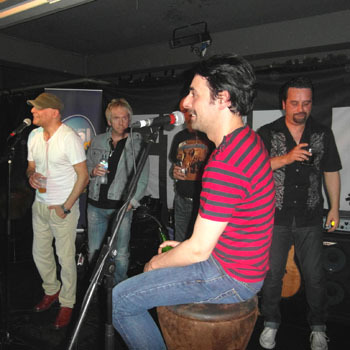 Following the set there was the afore mentioned Q&A session where we learned, amongst other facts, that the decision to have Dante as vocalist was made in the pub and that both Dante and drummer Paul McManus were subsequently barred from said establishment! There was also an opportunity to listen to 'Break The Silence' in its entirety. Due for release in July, it sounds like a return to early form and will hopefully re-establish Gun as one of the country's top rock acts, a position that, on tonight's showing ,they most definitely deserve to be in. Welcome back guys.